Watersheds are nature’s way of dividing up the landscape. Rivers, lakes, estuaries, wetlands, streams, even the oceans can serve as catch basins for the land adjacent to them. Ground water aquifers serve the same purpose for the land above them.The actions of people who live within a watershed affect the health of the waters that drain into it. Read more: The Ten Biggest American Cities That Are Running Out Of Water – 24/7 Wall St. http://247wallst.com/2010/10/29/the-ten-great-american-cities-that-are-dying-of-thirst/3/#ixzz13yhgCK3D Spring Creek, a tributary to Rowlett Creek and the East Fork of the Trinity River June 21, 2003Houston: Throughout most of its history, the city of Houston primarily drew water from the Jasper Aquifer, located along the southeastern coast of Texas. Notes: The map shows that the Spring Creek watershed is largely residential , not industrial as many think. Problems with water quality can, therefore, be traced to residential sources for the most part. Year 3 samples taken in 2008 at Spring Creek included measurements of suspended solids, pH, metals, biological oxygen demand (BOD), and other measurements. Samples were taken during rain events which had at least 0.10 inch of rain following a 72 hour period with no more than 0.10 inch of rain. All concentrations were normal except for total suspended solids (TSS), and bacterial (e.coli ). TSS levels were slightly elevated, but not of too much concern. E.coli concentrations, however, were high and means Spring Creek is not suitable for contact recreation such as wading or swimming. Sources of e.coli contamination include sanitary sewer overflow, warm-blooded animal waste, and improper backup pipes in domestic homes. Spring Creek water quality conditions are worse upstream in the cities of Richardson and Plano. Sec. 31.106. Special development regulations for the Rowlett and Spring Creek 100-year flood plains. (A) The following provisions shall apply to all proposed development within the Rowlett and Spring Creek 100-year flood plains, as more particularly described on the Albert H. Halff Associates, Inc., series April 1987 topographical maps, Project AVO-8470, Sheets 6-7, 18-20, 31-34, 45-57, 59-66 and 72-78. (1) Base flood elevations (BFE) for the 100-year flood event that reflect ultimate development land use throughout the watershed shall be used for design and planning of flood plain development. (2) Development within the flood plain shall be permitted only if it can be demonstrated that there will be no rise in the base flood elevation. (3) Fill volumes shall be balanced (+/- 15%) by excavation volumes to preserve overall valley storage within the flood plain. Areas excavated shall be landscaped to restore a natural cover. (4) The bed and banks of Rowlett and Spring Creeks shall be left in a natural state to control erosive velocities, prevent excessive downstream discharges and preserve the natural effect of the stream. Exceptions are permitted for major bridge crossings, public welfare and safety. (5) Increases to existing average velocities shall be allowed to a maximum average velocity of no greater than six (6) feet per second. (6) Significant stands of trees and other environmental features within the flood plain shall be preserved. STATION 08061540 ROWLETT CREEK NR SACHSE, TX Spring Creek is a tributary to Rowlett Creek. 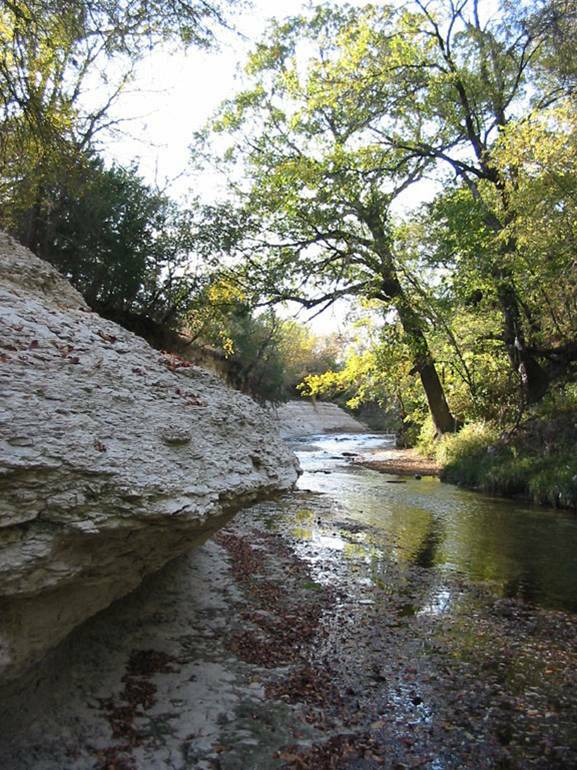 This web site by the U.S. Geological Survey Water Resources Division provides water quality and streamflow information for streams in Texas, including this monitoring site closest to Spring Creek Preserve: Rowlett Creek near the town of Sachse (STATION 08061540). The station is maintained in cooperation with the City of Dallas, Water Utilities Department. By clicking on this site, you can plot gage height (measurement of surface water elevation) or discharge (measurement of streamflow in cubic feet per second). Other information includes water quality parameters such as alkalinity, nitrates, dissolved oxygen, and pH. Since Spring Creek is a tributary to Rowlett Creek, hydrologic conditions are similar, but with a lower discharge rate since the further up a tributary you travel, the smaller the contributing watershed area for surface runoff and shallow groundwater discharge. The drainage area for Rowlett Creek is 120 square miles. Rowlett Creek is a tributary to the East Fork of the Trinity River, which eventually flows into the Gulf of Mexico. A small, spring-fed tributary to Spring Creek. An inventory of springs in the area is needed. Below is a plot of the mean annual discharge at Rowlett Creek from 1969-1998. A disturbing trend is the increase in discharge in more recent years possibly due toland clearing and coversion to industrial and residential development along with acres and acres of paved roads. Flashier storm peaks increase the erosion potential along stream banks and causes fluvial geomorphologic changes in the river system such as headcutting and meander widening. The mean annual flow has generally increased over the 29 years of record, as evidenced in the graph. A watershed needs to have about 15-20 percent of its landscape free of roads and development (pervious versus impervious) in order to function properly….this includes groundwater recharge, stream equilibrium (balance of aggradation and degradation), near normal aquatic biological communities, normal surface temperatures, flood attenuation, and for functions that remain undiscovered. The following is information by the U.S. Geological Survey Water Resources Division: Nonpoint source stormwater runoff in urban areas is now a leading threat to water quality, and the percentage of impervious surface within a particular watershed has been recognized as a key indicator of the effects of nonpoint runoff and of future water and ecosystem quality (Arnold and Gibbons, 1996; USEPA,1994). The imperviousness issue has even been suggested as a unifying theme for overall study of watershed protection (Schueler, 1994) and as part of an urban ecosystems analytical model (Ridd, 1995).